“No-Frills Samba Servers” focused on the basics of simple yet effective network solutions. Network administrators who take pride in their work (that's most of us, right?) take care to deliver what our users want, but not too much more. If we make things too complex, we confound our users and increase costs of network ownership. A professional network manager avoids the temptation to put too much pizazz into the way that the network operates. Some creativity is helpful, but keep it under control good advice that the following two scenarios illustrate. In one case the network administrator of a mid-sized company spent three months building a new network to replace an old Netware server. What he delivered had all the bells and whistles he could muster. There were a few teething problems during the changeover, nothing serious but a little disruptive all the same. Users were exposed to many changes at once. The network administrator was asked to resign two months after implementing the new system because so many staff complained they had lost time and were not happy with the new network. Everything was automated, and he delivered more features than any advanced user could think of. He was just too smart for his own good. In the case of the other company, a new network manager was appointed to oversee the replacement of a LanTastic network with an MS Windows NT 4.0 network. He had the replacement installed and operational within two weeks. Before installation and changeover, he called a meeting to explain to all users what was going to happen, how it would affect them, and that he would be available 24 hours a day to help them transition. One week after conversion, he held another meeting asking for cooperation in the introduction of a few new features that would help to make life easier. Network users were thrilled with the help he provided. The network he implemented was nowhere near as complex as in the first example, had fewer features, and yet he had happy users. Months later he was still adding new innovations. He always asked the users if a particular feature was what they wanted. He asked his boss for a raise and got it. He often told me, “Always keep a few new tricks up your sleeves for when you need them.” Was he smart? You decide. Let's get on with our next exercise. Abmas Accounting has grown. Mr. Meany likes you and says he knew you were the right person for the job. That's why he asked you to install the new server. The past few months have been hard work. You advised Mr. Meany that it is time for a change. Abmas now has 52 users, having acquired an investment consulting business recently. The new users were added to the network without any problems. Some of the Windows clients are nearly past their use-by date. You found damaged and unusable software on some of the workstations that came with the acquired business and found some machines in need of both hardware and software maintenance. Mr. Meany is retiring in 12 months. Before he goes, he wants you to help ensure that the business is running efficiently. Many of the new staff want notebook computers. They visit customer business premises and need to use local network facilities; these users are technically competent. The company uses a business application that requires Windows XP Professional. In short, a complete client upgrade is about to happen. Mr. Meany told you that he is working on another business acquisition and that by the time he retires there will be 80 to 100 users. Mr. Meany is not concerned about security. He wants to make it easier for staff to do their work. He has hired you to help him appoint a full-time network manager before he retires. Above all, he says he is investing in the ability to grow. He is determined to live his lifelong dream and hand the business over to a bright and capable executive who can make things happen. This means your network design must cope well with growth. In a few months, Abmas will require an Internet connection for email and so that staff can easily obtain software updates. Mr. Meany is warming up to the installation of antivirus software but is not yet ready to approve this expense. He told you to spend the money a virus scanner costs on better quality notebook computers for mobile users. One of Mr. Meany's golfing partners convinced him to buy new laser printers, one black only, the other a color laser printer. Staff support the need for a color printer so they can present more attractive proposals and reports. Mr. Meany also asked if it would be possible for one of the staff to manage user accounts from the Windows desktop. That person will be responsible for basic operations. In this instance the installed Linux system is assumed to be a Red Hat Linux Fedora Core2 server (as in “Accounting Office”). It is time to implement a domain security environment. You will use the smbpasswd (default) backend. You should implement a DHCP server. There is no need to run DNS at this time, but the system will use WINS. The domain name will be BILLMORE. 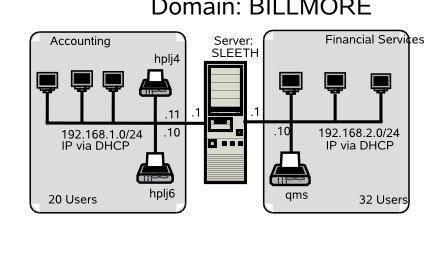 This time, the name of the server will be SLEETH. All printers will be configured as DHCP clients. The DHCP server will assign the printer a fixed IP address by way of its Ethernet interface (MAC) address. See “Abmas Accounting DHCP Server Configuration File /etc/dhcpd.conf”. The smb.conf file you are creating in this exercise can be used with equal effectiveness with Samba-2.2.x series releases. This is deliberate so that in the next chapter it is possible to start with the installation that you have created here, migrate it to a Samba-3 configuration, and then secure the system further. Configurations following this one utilize features that may not be supported in Samba-2.2.x releases. However, you should note that the examples in each chapter start with the assumption that a fresh new installation is being effected. Later on, when the Internet connection is implemented, you will add DNS as well as other enhancements. It is important that you plan accordingly. You have split the network into two separate areas. Each has its own Ethernet switch. There are 20 users on the accounting network and 32 users on the financial services network. The server has two network interfaces, one serving each network. The network printers will be located in a central area. You plan to install the new printers and keep the old printer in use also. You will provide separate file storage areas for each business entity. The old system will go away, accounting files will be handled under a single directory, and files will be stored under customer name, not under a personal work area. Staff will be made responsible for file location, so the old share point must be maintained. Given that DNS will not be used, you will configure WINS name resolution for UNIX hostname name resolution. It is necessary to map Windows Domain Groups to UNIX groups. It is advisable to also map Windows Local Groups to UNIX groups. Additionally, the two key staff groups in the firm are accounting staff and financial services staff. For these, it is necessary to create UNIX groups as well as Windows Domain Groups. In the sample smb.conf file, you have configured Samba to call the UNIX groupadd to add group entries. This utility does not permit the addition of group names that contain uppercase characters or spaces. This is considered a bug. The groupadd is part of the shadow-utils open source software package. A later release of this package may have been patched to resolve this bug. If your operating platform has this bug, it means that attempts to add a Windows Domain Group that has either a space or uppercase characters in it will fail. See TOSHARG2, Chapter 11, Section 11.3.1, Example 11.1, for more information. Vendor-supplied printer drivers will be installed on each client. The CUPS print spooler on the UNIX host will be operated in raw mode. Mr. Meany is an old-school manager. He sets the rules and wants to see compliance. He is willing to spend money on things he believes are of value. You need more time to convince him of real priorities. Go ahead, buy better notebooks. Wouldn't it be neat if they happened to be supplied with antivirus software? Above all, demonstrate good purchase value and remember to make your users happy. In this example, the assumption is made that this server is being configured from a clean start. The alternate approach could be to demonstrate the migration of the system that is documented in “Implementation” to meet the new requirements. The decision to treat this case, as with future examples, as a new installation is based on the premise that you can determine the migration steps from the information provided in “Migrating NT4 Domain to Samba-3”. Additionally, a fresh installation makes the example easier to follow. Each user will be given a home directory on the UNIX system, which will be available as a private share. Two additional shares will be created, one for the accounting department and the other for the financial services department. Network users will be given access to these shares by way of group membership. UNIX group membership is the primary mechanism by which Windows Domain users will be granted rights and privileges within the Windows environment. The user alanm will be made the owner of all files. This will be preserved by setting the sticky bit (set UID/GID) on the top-level directories. Using UNIX/Linux system tools, name the server sleeth. Install the Samba-3 binary RPM from the Samba-Team FTP site. Install the ISC DHCP server using the UNIX/Linux system tools available to you. This causes the Linux kernel to forward IP packets so that it acts as a router. Install the smb.conf file as shown in “Accounting Office Network smb.conf File [globals] Section” and “Accounting Office Network smb.conf File Services and Shares Section”. Combine these two examples to form a single /etc/samba/smb.conf file. This is the Windows Domain Administrator password. Never delete this account from the password backend after Windows Domain Groups have been initialized. If you delete this account, your system is crippled. You cannot restore this account, and your Samba server can no longer be administered. #       user names 'Jim' and 'Bones' because the space was not quoted. For each user who needs to be given a Windows Domain account, make an entry in the /etc/passwd file as well as in the Samba password backend. Use the system tool of your choice to create the UNIX system accounts, and use the Samba smbpasswd program to create the Domain user accounts. There are a number of tools for user management under UNIX, such as useradd and adduser, as well as a plethora of custom tools. With the tool of your choice, create a home directory for each user. Using the preferred tool for your UNIX system, add each user to the UNIX groups created previously, as necessary. File system access control will be based on UNIX group membership. Create the directory mount point for the disk subsystem that is mounted to provide data storage for company files. In this case the mount point is indicated in the smb.conf file is /data. Format the file system as required, mount the formatted file system partition using mount, and make the appropriate changes in /etc/fstab. Each department is responsible for creating its own directory structure within its share. The directory root of the accounts share is /data/accounts. The directory root of the finsvcs share is /data/finsvcs. Configure the printers with the IP addresses as shown in “Abmas Accounting 52-User Network Topology”. Follow the instructions in the manufacturers' manuals to permit printing to port 9100. This allows the CUPS spooler to print using raw mode protocols. Using your favorite system editor, create an /etc/dhcpd.conf with the contents as shown in “Abmas Accounting DHCP Server Configuration File /etc/dhcpd.conf”. #   traffic by up to 90%. Does everything function as it ought? That is the key question at this point. Here are some simple steps to validate your Samba server configuration. Clear away all errors before proceeding, and start or restart samba as necessary. The winbindd daemon is running in split mode (normal), so there are also two instances of it. For more information regarding winbindd, see TOSHARG2, Chapter 23, Section 23.3. The single instance of smbd is normal. This demonstrates that an anonymous listing of shares can be obtained. This is the equivalent of browsing the server from a Windows client to obtain a list of shares on the server. The -U% argument means to send a NULL username and a NULL password. PING hplj4 (192.168.1.11) 56(84) bytes of data. The MAC address 08:00:46:7A:35:E4 matches that specified for the IP address from which the printer has responded and the entry for it in the /etc/dhcpd.conf file. Configure clients to the network settings shown in “Abmas Accounting 52-User Network Topology”. All clients use DHCP for TCP/IP protocol stack configuration. DHCP configures all Windows clients to use the WINS Server address 192.168.1.1. Join the Windows Domain called BILLMORE. Use the Domain Administrator username root and the SMB password you assigned to this account. A detailed step-by-step procedure for joining a Windows 200x/XP Professional client to a Windows Domain is given in “A Collection of Useful Tidbits”, “Joining a Domain: Windows 200x/XP Professional”. Reboot the machine as prompted and then log on using a Domain User account. Verify on each client that the machine called SLEETH is visible in My Network Places, that it is possible to connect to it and see the shares accounts and finsvcs, and that it is possible to open that share to reveal its contents. Instruct all users to log onto the workstation using their assigned username and password. Click Next. In the Manufacturer: panel, select HP. In the Printers: panel, select the printer called HP LaserJet 4. Click Next. You may be prompted for the name of a file to print to. If so, close the dialog panel. Right-click HP LaserJet 4 → Properties → Details (Tab) → Add Port. In the Network panel, enter the name of the print queue on the Samba server as follows: \\SERVER\hplj4. Click OK+OK to complete the installation. Repeat the printer installation steps above for the HP LaserJet 6 printer as well as for the QMS Magicolor XXXX laser printer. As a network administrator, you already know how to create local machine accounts for Windows 200x/XP Professional systems. This is the preferred solution to provide continuity of work for notebook users so that absence from the office network environment does not become a barrier to productivity. By creating a local machine account that has the same username and password as you create for that user in the Windows Domain environment, the user can log onto the machine locally and still transparently access network resources as if logged onto the domain itself. There are some trade-offs that mean that as the network is more tightly secured, it becomes necessary to modify Windows client configuration somewhat. You implemented a DHCP server, and Microsoft Windows clients were able to obtain all necessary network configuration settings from this server. You created a Windows Domain Controller. You were able to use the network logon service and successfully joined Windows 200x/XP Professional clients to the Domain. You created raw print queues in the CUPS printing system. You maintained a simple printing system so that all users can share centrally managed printers. You installed native printer drivers on the Windows clients. You experienced the benefits of centrally managed user accounts on the server. You offered Mobile notebook users a solution that allows them to continue to work while away from the office and not connected to the corporate network. Your new Domain Controller is ready to serve you. What does it mean? Here are some questions and answers that may help. 1. What is the key benefit of using DHCP to configure Windows client TCP/IP stacks? 2. Are there any DHCP server configuration parameters in the /etc/dhcpd.conf that should be noted in particular? 3. Is it possible to create a Windows Domain account that is specifically called Administrator? 4. Why is it necessary to give the Windows Domain Administrator a UNIX UID of 0? 5. One of my junior staff needs the ability to add machines to the Domain, but I do not want to give him root access. How can we do this? 6. Why must I map Windows Domain Groups to UNIX groups? 7. I deleted my root account and now I cannot add it back! What can I do? 8. When I run net groupmap list, it reports a group called Administrators as well as Domain Admins. What is the difference between them? 9. What is the effect of changing the name of a Samba server or of changing the Domain name? 10. How can I manage user accounts from my Windows XP Professional workstation? What is the key benefit of using DHCP to configure Windows client TCP/IP stacks? First and foremost, portability. It means that notebook users can move between the Abmas office and client offices (so long as they, too, use DHCP) without having to manually reconfigure their machines. It also means that when they work from their home environments either using DHCP assigned addressing or when using dial-up networking, settings such as default routes and DNS server addresses that apply only to the Abmas office environment do not interfere with remote operations. This is an extremely important feature of DHCP. Are there any DHCP server configuration parameters in the /etc/dhcpd.conf that should be noted in particular? Yes. The configuration you created automatically provides each client with the IP address of your WINS server. It also configures the client to preferentially register NetBIOS names with the WINS server, and then instructs the client to first query the WINS server when a NetBIOS machine name needs to be resolved to an IP Address. This configuration results in far lower UDP broadcast traffic than would be the case if WINS was not used. Is it possible to create a Windows Domain account that is specifically called Administrator? You can surely create a Windows Domain account called Administrator. It is also possible to map that account so that it has the effective UNIX UID of 0. This way it isn't necessary to use the username map facility to map this account to the UNIX account called root. Why is it necessary to give the Windows Domain Administrator a UNIX UID of 0? The Windows Domain Administrator account is the most privileged account that exists on the Windows platform. This user can change any setting, add, delete, or modify user accounts, and completely reconfigure the system. The equivalent to this account in the UNIX environment is the root account. If you want to permit the Windows Domain Administrator to manage accounts as well as permissions, privileges, and security settings within the Domain and on the Samba server, equivalent rights must be assigned. This is achieved with the root UID equal to 0. One of my junior staff needs the ability to add machines to the Domain, but I do not want to give him root access. How can we do this? Users who are members of the Domain Admins group can add machines to the Domain. This group is mapped to the UNIX group account called root (or the equivalent wheel on some UNIX systems) that has a GID of 0. This must be the primary GID of the account of the user who is a member of the Windows Domain Admins account. Why must I map Windows Domain Groups to UNIX groups? Samba-3 does not permit a Domain Group to become visible to Domain network clients unless the account has a UNIX group account equivalent. The Domain groups that should be given UNIX equivalents are Domain Guests, Domain Users, and Domain Admins. I deleted my root account and now I cannot add it back! What can I do? This is a nasty problem. Fortunately, there is a solution. Back up your existing configuration files in case you need to restore them. Use the smbpasswd to add the root account. When I run net groupmap list, it reports a group called Administrators as well as Domain Admins. What is the difference between them? The group called Administrators is representative of the same account that would be present as the Local Group account on a Domain Member server or workstation. Samba uses only Domain Groups at this time. A Workstation or Server Local Group has no meaning in a Samba context. This may change at some later date. These accounts are provided only so that security objects are correctly shown. What is the effect of changing the name of a Samba server or of changing the Domain name? If you elect to change the name of the Samba server, on restarting smbd, Windows security identifiers are changed. In the case of a standalone server or a Domain Member server, the machine SID is changed. This may break Domain membership. In the case of a change of the Domain name (Workgroup name), the Domain SID is changed. This affects all Domain memberships. If it becomes necessary to change either the server name or the Domain name, be sure to back up the respective SID before the change is made. You can back up the SID using the net getlocalsid (Samba-3) or the smbpasswd (Samba-2.2.x). To change the SID, you use the same tool. Be sure to check the man page for this command for detailed instructions regarding the steps involved. How can I manage user accounts from my Windows XP Professional workstation? Samba-3 implements a Windows NT4-style security domain architecture. This type of Domain cannot be managed using tools present on a Windows XP Professional installation. You may download from the Microsoft Web site the SRVTOOLS.EXE package. Extract it into the directory from which you wish to use it. This package extracts the tools: User Manager for Domains, Server Manager, and Event Viewer. You may use the User Manager for Domains to manage your Samba-3 Domain user and group accounts. Of course, you do need to be logged on as the Administrator for the Samba-3 Domain. It may help to log on as the root account.